The Virtual Baseball League | Making Virtual Baseball – Your Reality! Making Virtual Baseball – Your Reality! The Virtual Baseball League is currently made up of two separate but equally awesome OOTP simulation leagues. The history of the VBL dates back to the mid 1990’s, when Front Page Sports was the simulation platform of choice. Since 2012 though, OOTP has become the foundation for our great community. Currently, all three of our leagues operate using OOTP 16. While many aspects of each league differ, the one rule that will never change in any league associated with the VBL is that the Commissioner does NOT own or operate any franchise within his league. The only time a Commissioner might operate a team within his own league is if the team is left without an owner or a team’s owner is away from OOTP for an extended period of time. You can view the OOTP pages for each of our leagues underneath our banner at the top of this page. If you’re interested in joining either league, our contact information is at the bottom of each league Constitution page. Here is a brief summary of each league. The league is governed by the Commissioner. From 2002-2012 (real time) the Commissioner ran the VBL3 which was simmed using Front Page Sports 98. After 10 years and 20 seasons, it was time to move on to better technology. In 2012 the OOTP 13 league ‘VBL’ began with many of the same owners from the VBL3. After 10 years were simmed, all owners participated in an inaugural draft. The first year of the VBL was 2002 in-game and 2012 real time. The league began using real players, but in the 2004 season transitioned to utilizing a Feeder League system. 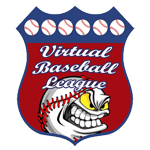 While several of the Feeder players are “real”, the VBL is mostly known as a Fictional league. 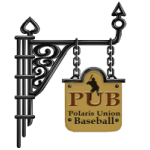 Colloquially known as “PUB”, Polaris Union rose from the ashes of ACBA – American Canadian Baseball Alliance. PUB team GMs hail from the U.S. and Canada and it is this North American bond which inspired the name “Polaris Union” – Polaris also being known as the North Star. The league is loosely semi-historical with a majority of fictional players but a few familiar names from the era thrown-in. Original owners drafted their players out of a pool of 1950 Major League Baseball and fictional players. Owners also drafted scouts. The inaugural draft was 25 rounds, followed by the scout filling in the rest. Prior to the draft, 15 years of league history were simmed. Players developed through OOTP engine, not real life stats. The league is simulated as a career league, players will age and eventually retire. New players are added via the Amateur Draft and are selected during the off-season. Players will enter the amateur draft through a College & High School Feeder League.